About a month ago I noticed that I had a dead pine tree in the back yard, one of the two trees holding up younger niece's hammock, in fact. As said tree is at the fenceline, at a corner of my garden shed, and at the corner of the neighbors' house (not my brother's family but the other neighbors), it needs to come down. I've also been contemplating slowly removing pines and replacing them with hardwoods, or rather letting the juvenile hardwoods that have volunteered have more room and light to grow. Over the years I've owned this house (gee, 17 years now? Since 1994) I've taken out a very large pine in the front that succumbed to pine bark beetles, and 2 or 3 between my house and my brother's that included the one that dropped a limb through the roof during an ice storm. I decided that in addition to the dead one, I'd take out 3 pines along the fence in my back yard, one of which lost its top in that same ice storm and so has been prone to grow more top-heavy. I have a good-sized young red oak back in the corner of the yard that should stand out more with these pines gone, and two young dogwoods that were flanking one of the pines that I hope will survive the tree removal process and that should still provide cover for the bluebird box on its pole. The dead tree is in a cluster of other pines that will stay, for now at least. Today the tree company (DeKalb Tree Service) is doing the work. There are 8 or 10 men working: right now they are taking down 2 of the healthy pines at once, so there's a guy up each tree with a chainsaw, and the crew on the ground are handling ropes as hey tie off trunk segments (having already removed all the limbs) to the third tree that's to come down, cut them off, and rope them down. I'm waiting to see how they'll then take down the third one, which will then have no neighbor tree close enough (I think) to use for the ropes. These trees are very tall--I"m not good at estimating heights, but I'd think we're talking 90-100 feet at least. Don't think this makes much of a dent in my tree cover. Despite having a smallish suburban lot (<1/3 acre), I've got a lot of trees. 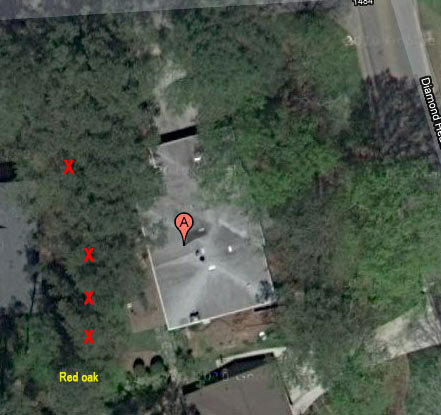 Quick Google Maps satellite grab below with approximate locations of the trees being removed--only approximate, as I can't pick out individual trees or even the fence lines with the image resolution. That's my brother's house at the bottom with their bright-white newish driveway, and the other neighbor on the left edge. My roof is pretty well defined, and my driveway extends to the north/top. The cats, of course, find this all very distressing. People walking by the windows, strange noises including the occasional loud thump--all this on Friday, when I'm supposed to be available to provide a cat-lap and other services as required. It's Not Right. Cats are funny that way [wry g]. My dad once singlehandedly, branch by branch, took down three 90' evergreen ash trees that grew along (and were uprooting) our driveway in Southern California when I was a kid. They were about 12 feet from our house, and about 15 feet from our neighbor's house. My mother once told me that she spent the entire month of weekends he spent cutting those trees down with her heart in her throat, waiting for him to fall and kill himself. He didn't, fortunately.